Currently, there is already a high demand for storage space in Canada. Affordable housing and storage space is becoming harder and harder to find, but Canadians are still consuming more than ever before. As a result, many Canadians simply have too much stuff for their home, so they need to find adequate storage space for their personal belongings. Self-storage is an affordable and convenient storage option that allows them to keep all of their belongings while freeing up space in their home. Although space is limited, especially in urban areas where new apartment complexes and condos cram more apartment units into less space, Canadians continue to buy more things. Self-storage units are often the most convenient and affordable option when space runs out. Self-storage isn’t limited to families and consumers with too much stuff. Many small businesses—especially those who operate online—use storage units as a home-base for their business. This allows them to set up a storage unit that can be used to store files and inventory in a safe, secure location. Small businesses have recognized the value of paying smaller fees on a monthly basis to store their inventory and files, rather than having to pay astronomical rent prices in urban areas for additional storage space in their office. Beyond high demand for storage space, there is also a premium on self-storage units in urban centres such as Toronto, particularly because it is so difficult to find. Because urban areas are growing so quickly and real estate prices are so high, few can afford to offer significant storage space for consumers. There is a limited amount of space in urban areas, and it is dominated with condos and other real estate projects. Since real estate in urban areas is running out, prices are heavily inflated, making it difficult for those without the necessary capital to invest in businesses that require a lot of space. 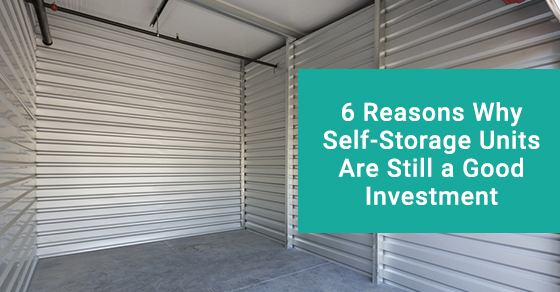 However, if you have access to the amount of money necessary to invest in self-storage units, you can make a great deal of money because the demand is so high. While many real estate investors aim for a breakeven point of approximately 50-60% capacity, self-storage units offer a much more attractive break-even number. Depending on your leasing and financing situation, many self-storage units break even at approximately 40-45% capacity. As a result, it is entirely possible that you will see a greater return on your self-storage investment than on typical residential spaces such as apartments and condos. Not only will you be able to make your money back at a lower break-even point compared to other commercial and real estate investments, but self-storage units also start producing revenue almost immediately. As soon as you are up-and-running, it is likely that you will be able to rent out a significant portion of your storage space in just a few months time because demand is so high. While the industry can be very competitive, demand simply outnumbers the supply. For those who offer customer-oriented add-ons such as flexible terms and moving services, it can be easy to turn a profit. One competitive advantage of major players in the self-storage industry is their ability to innovate. Storage companies are always creating new and innovative ways to adapt their business model to remain competitive in the industry and attract a larger customer base. From offering pick-up services with hired movers to implementing climate-control technology to keep belongings safe in storage units, there is a wealth of opportunity for investors looking to improve upon the standards of the industry and make a profit doing so. Some storage facilities offer automated security systems that restrict access to the facility to those who have rented a unit. Since this type of technology is more affordable than it was five years ago, outfitting your facility with modern features can require minimal investment and increase your customer base. For more information about investing in storage units, call Ultrastor at 289-288-5069 or contact us here.